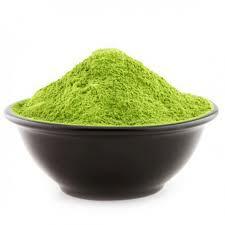 Barley Grass Powder is one of the best alkaline plant based nutrient dense food. It is an excellent organ and system detoxifier and energy booster. Enzyme P4D1: P4D1 is an enzyme – an extraordinary compound found in Barley Grass Juice Powder. It is the first substance known to stimulate the repair of DNA molecules. P4D1 does two important things. The super enzyme makes it possible for diseased cells to heal themselves so that they can go on to produce “good” cells. Even more amazing is the fact that P4D1 has been shown in laboratory tests to eat through the protein sheath of cancer cells so that white blood cells can attack and destroy them. P4d1 suppresses or cures pancreatitis, stomatitis, inflammation of the oral cavity, and dermatitis, & also lacerations of the stomach and the duodenum. All Rounder Superfood: Barley Grass Juice Powder is an amazing plant-based liver detoxifier, chemically neutralizing toxins in the body and working to keep the blood and gastrointestinal tract clean. It stimulates the metabolism and enzyme systems by increasing red blood cell count. Nutrient Dense Food: It is packed with vitamins, minerals, essential amino acids, chlorophyll, flavonoids, trace elements, antioxidants and live enzymes. Gluten Free: Barley grass is inherently gluten-free. The barley plant only becomes gluten-containing once a head of grain develops. Mix 1 tsp of powder in half a glass of fresh orange or mandarin juice or coconut water. I add a pinch of turmeric for its amazing anti-inflammatory and anti oxidant properties and a pinch of cinnamon for its blood sugar stabilizing properties. Mix with a spoon or a battery driven whiz. Enjoy the green goodness and sunshine food!